The England quartet confirmed their current status as the world's leading Team Pursuit line-up with a polished, pacy, almost clinical demolition of the opposition. It was a good morning for the England Team Pursuiters who came out of the qualifying ride with the fastest time of 4.05.248 to go through to the ride off for Gold. The English team were fastest through every time-check point. After the ride, the England team returned to warm down on the rollers as their coach, Simon Jones went through the good and bad of the ride as he stressed that the team making the least errors will come out on top. As ever, it was the Australians, victors over GB at the last Olympics and Commonwealth Games, who proved to be the main competition. Not that it was plain sailing with the Aussies having a false start and having to go through the starting procedure again before going on to record a time almost one and a half seconds slower than the English. 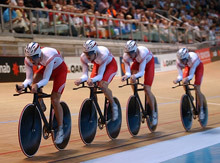 Third fastest were New Zealand who after winning the Manchester World Track Cup were expected to threaten the favourites. They began really well and were on a schedule to threaten England and Australia, but a missed change contributed to a poor closing couple of laps and they missed their chance. New Zealand were much too strong for Malaysia in the ride-off for bronze, but one sensed that it was a case of what might have been for the men in black who have improved out of all recognition in the last year and who may well threaten at the Worlds in a few weeks time. This was the race the fans really wanted to see - the two best teams in the world over the last few years going head-to-head. The Aussies got off to a great start and were four tenths up after a lap, but the England quartet soon got into their stride, cutting that lead to a tenth after two laps and going ahead after three. A 64 second first kilo showed their intent and although the Aussies were visibly straining every fibre to keep on terms, the experienced England Team were not going to let them dictate terms and pulled steadily clear. By the end they were almost in the same straight as their rivals and could enjoy the final few metres knowing that they were going to add the Commonwealth title to their World crown. After years of giving best to the Aussies, the last 12 months have been payback time and you could see the satisfaction in the eyes of riders like Chris Newton, Rob Hayles and double gold medallist Paul Manning. In the tunnel as they were getting ready to be presented with their Gold medals, Rob Hayles said "I wanted a Gold, I told everyone I am coming home with a Gold so I've got it now. Success breeds success and that's proven with the younger lads." When I asked about the Scratch race he's down to do on Sunday, he replied "apparently I am doing that. I guess I won't be having that beer in dope control now!" I then turned to Paul Manning who said "I was really satisfied with that ride because we got the Gold that we all wanted. It was the same feeling at the Worlds where can enjoy it now. We worked really hard for this and we did a very respectful time in the final and so are very happy. As a team we take immense satisfaction from these two rides today. It's great when all the work comes together at a major championships like this." "There's still lots to come from us" Manning added. "There are technical improvements we can make. We are always improving but then so is the level of the event. We have to keep on our toes and keep pushing for good times." Manning said winning his second gold of the Games was not on his mind before the race. "I came concentrating on the team pursuit," he said. "The individual was just a bonus really." Chris Newton's reaction was "we did a professional job this morning to get through to the final and tonight we had a quicker schedule. Although we were a bit ragged at times, we were really gunning for the win. It's fantastic." Chris had sacrificed a ride in the Points race to go for Gold in the Team event and when asked his reaction to having achieved that gold, he said "it was worth the sacrifice and helped give my motivation an edge. I was really up for this win. He then said that the next big aim is the Olympic Gold. "There are still a few World Championships in between but Olympic Gold is certainly the next big one." 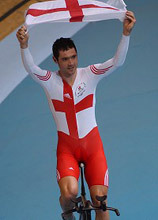 For Steve Cummings, he now had a Gold to go with the Bronze in the Individual Pursuit. After the win he had this to say "Brilliant in it! This is what I came for and I am relieved and its been worthwhile missing the spring classics for this. This is why it had to be gold. I don't know what I would have done if we had lost." Asked how he felt on the track after such a strong opening season on the road, he replied "I felt really good just now. This morning I didn't feel great and made a big mistake and paid for it. It's only that I'm going well at the moment, that I got away with it and then tonight I've gone out and put it right and also, the other people who made mistakes this morning put them right. It was a polished performance I thought."